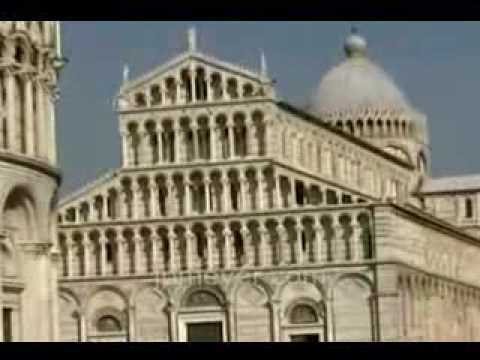 The Leaning Tower of Pisa (Italian: Torre pendente di Pisa) or simply the Tower of Pisa (La Torre di Pisa) is the campanile, or freestanding bell tower, of the cathedral of the Italian city of Pisa. It is situated behind the Cathedral and is the third oldest structure in Pisa's Cathedral Square (Piazza del Duomo) after the Cathedral and the Baptistry. The height of the tower is 55.86 m (183.27 ft) from the ground on the lowest side and 56.70 m (186.02 ft) on the highest side. The width of the walls at the base is 4.09 m (13.42 ft) and at the top 2.48 m (8.14 ft). Its weight is estimated at 14,500 metric tons (16,000 short tons). The tower has 296 or 294 steps; the seventh floor has two fewer steps on the north-facing staircase. Prior to restoration work performed between 1990 and 2001, the tower leaned at an angle of 5.5 degrees, but the tower now leans at about 3.99 degrees. This means that the top of the tower is 3.9 metres (12 ft 10 in) from where it would stand if the tower were perfectly vertical. 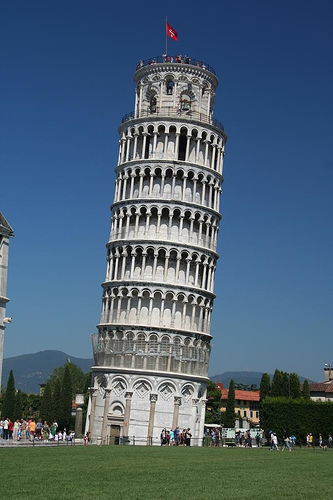 Tourists stand in front of the tipsy tower, leaning at a jaunty angle themselves, and take snapshots in which they seem to disobey the laws of gravity. In fact, people have been having fun with the tower's tilt for centuries. 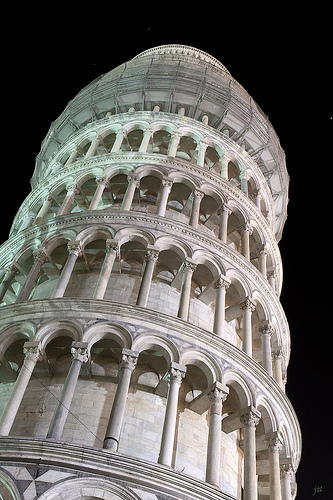 When construction of this campanile began in 1173, Pisa was a trading center at the peak of its military might and artistic achievement. Much to the embarrassment of Pisans, however, their white marble tower began to tilt even before its third story was finished in 1274.